Flickr Hive Mind / Blackmagic on Flickr - Application Sharing! 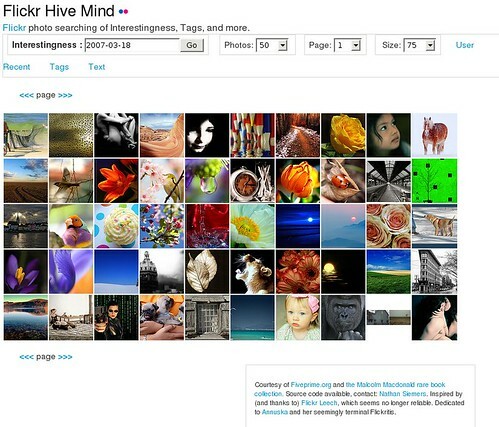 Flickr Hive Mind is a data mining tool for the Flickr photography database, allowing search by: tags(keywords); Flickr photography groups; Flickr users, their contacts, and favorites; free text; the Flickr Explore algorithm for interestingness. Flickr Hive Mind can also be an effective tool to identify photography with licenses that allow non-commercial (and sometimes) commercial use. Written by: Nathan Siemers. Inspired by (and thanks to) Flickr Leech.